Today, April 6th is Bohring-Opitz Syndrome Awareness Day. This day was chosen because that’s the day that the Bohring-Opitz Syndrome support group was created on Facebook, on April 6th 2011! This group has helped so many families to connect all over the world! With this awareness day we want to encourages people to learn more about Bohring-Opitz Syndrome to improve the lives of children and their families and caregivers living with this rare genetic condition. Why this colors? Many children with Bohring-Opitz Syndrome are suffering from high myopia. 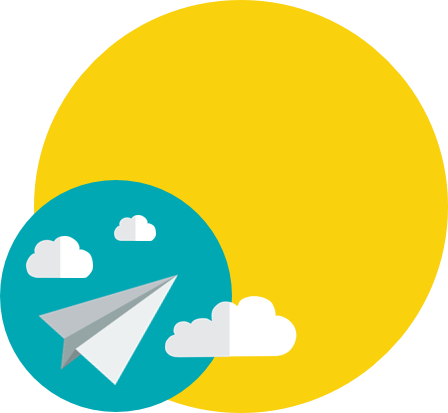 Contrasting colors like blue and yellow are the best perceived colors. Bohring-Opitz Syndrome is a rare genetic condition. Less than 60 cases are reported in medical literature worldwide. These are official numbers but here in our support group the number is now estimated to be closer to 200 families. However, throughout new diagnoses and available and better genetic testing, the number of children diagnosed with BOS became significant higher, Bohring-Opitz Syndrome is still ultra-rare and underdiagnosed. So that’s why we chose blue denim as awareness color for rare and genetic diseases. The second color is gold because our children love shimmering objects. And above all, our children are worth their weight in gold. The diamond is to honor all our children who became wings too early. We are excited to see so much engagement for us, the BOS Family. The Bohring-Opitz Syndrome Foundation is still dedicated to raise awareness for Bohring-Opitz Syndrome. In their press release (http://bos-foundation.org/blog/2019/4/5/spreading-awareness-of-bohring-opitz-syndrome-ultra-rare-syndrome-celebrates-its-day-in-the-spotlight you can read how they continue to strive to improve the quality of life for families living with BOS. Today is also the day that the ASXL Rare Research Endowment (AЯRE ) Foundation celebrates her first Anniversary. Happy Birthday AЯRE! The AЯRE Foundation was born to support research that will increase our understanding of the ASXL genes and to improve the treatment of individuals with congenital ASXL mutations. The leading cause for Bohring-Opitz is a mutation in the ASXL1 gene. ASXL1 belongs to human gene family with 3 members (ASXL1, ASXL2 – Shashi-Pena, and ASXL3 – Bainbridge-Ropers). There are many similarities between these three groups and they have much more in common than different. AЯRE key tenets include good stewardship of our resources and transparency. For this day the AЯRE Foundation published her donor summary: https://www.arrefoundation.org/arre-donor-summary-2018. However we sometimes have the feeling that too little is known about the syndrome, researchers are continue working on Bohring-Opitz syndrome. Did you know that in the past year that more than 10 new publications have been published about BOS? We would like to highlight the work of Dr. Bianca Russell and Dr. Wen-Hann Tan, who have done amazing progress in the research history of Bohring Opitz Syndrome due creating the Bohring-Opitz Patient Registry. If you haven’t enrolled yet, please consider to participate to the patient registry. Only research is creating new knowledge! On the last ASXL conference in Los Angeles Dr. Bianca Russell (The first year of the Bohring-Opitz Patient Registry ) and Dr. Wen-Hann Tan (ASXL1 Clinical Discussion) gave presentations about ASXL1/Bohring-Opitz. You can read and watch the presentations on the News Page of the AЯRE Foundation. The latest publication of Dr. Bianca Russell and Dr. Wen-Hann Tan you can read here: Bohring-Opitz Syndrome (https://www.ncbi.nlm.nih.gov/books/NBK481833/) If you are interested to learn more about Bohring-Opitz, you find more articles on our website. We are optimistic for the future of the BOS Family and looking forward to see all your personal creations and how you mark this special day! Let’s bring together children living with BOS, their families and caregivers out of isolation and put them in the spotlight by wearing GOLD & BLUE DENIM on April 6th! Research on Bohring-Opitz Syndrome are still going on and more medical articles about Bohring-Opitz Syndrome are published. The BOS & ASXL REGISTRY is here! More and more BOS Families enrol the BOS Patient Registry and help in building up the “Bohring-Opitz Syndrome (BOS) & ASXL related Registry”. This registry, created by Dr. Bianca Russell and Dr. Wen-Hann Tan, is a milestone in the history of Bohring-Opitz Syndrome and will result in a significant step in improving the lives of people affected with Bohring-Opitz Syndrome. Last year the ASXL Rare Research Endowment (AЯRE) Foundation (www.arrefoundation.org) is launced! AЯRE will provide sustainable support for evidence-based research that will increase our understanding of the ASXL genes and improve the treatment of individuals with congenital ASXL mutations. This year this foundation will organize the second ASXL Conference for researchers and families. And last but not least the Hollywood award winning documentary KULUUT can now be seen worldwide. Bohring-Opitz Syndrome is RARE – less than 100 children are published in medical articles since 1999. The largest number of children live in USA and UK, in other countries there are just 1-3 children diagnosed with Bohring-Opitz Syndrome. Bohring-Opitz Syndrome knows no borders. Children with BOS lives around the world in 28 countries and speak many languages. Bohring-Opitz Syndrome owes its NAME to the geneticists Axel Bohring and John M. Opitz. The terms ‘Bohring’, ‘Bohring-Opitz’ and ‘C-like syndrome’ have all been used to describe this condition. Because Frank Oberklaid reported another case there is also the name ‘Oberklaid-Danks-Syndrome’ for ‘Bohring-Opitz-Syndrome’. Since 1969 there have been 27 PUBLICATIONS on Bohring-Opitz Syndrome. Two articles are milestones in the medical history of BOS: 2011 the discovery of one genetic cause by Alexander Hoischen and 2015 the article of Bianca Russell who first presented treatments. Prior to 2011, geneticists relied on making a clinical diagnosis by recognizing the distinguishable physical characteristics in the appearance of their patients. In 2011, researchers at the Radboud University Nijmegen medical center used “next generation sequencing” to find the novo mutation in the ASXL1 gene as one GENETIC CAUSE of Bohring-Opitz Syndrome. BOS is genetically HETEROGENEOUS, meaning there must be at least one other cause of BOS. Because other children with a clinical diagnosis of BOS didn’t have this mutation, this indicates that other genes may be involved in this syndrome or that a somatic mosaicism should be considered as cause in patients with a typical phenotype and no detectable mutation. 2015 Bianca Russell and colleagues published an article about Bohring-Opitz Syndrome. Beside the presenting of eight new patients, in this article TREATMENT options were discussed for the first time and the authors suggests certain patients with Bohring–Opitz syndrome should be monitored for Wilms tumors. Researchers around the world are working hard for a better understanding of Bohring-Opitz Syndrome. Investigations like the ongoing sequencing campaign in Spain, RESEARCH on “mouse models” and a German study of the mechanism of ASXL1 gene in human stem cells brings us a step further that one day these knowledge will results in therapies for BOS children. Update: The BOS & ASXL REGISTRY is here! We need your help in building such a resource and encourage you to become part of the “Bohring-Opitz Syndrome (BOS) & ASXL related Registry”. This registry, created by Dr. Bianca Russell and Dr. Wen-Hann Tan, is a milestone in the history of Bohring-Opitz Syndrome and the more people registered, the more valid and valuable the information becomes, which will result in a significant step in improving the lives of people affected with Bohring-Opitz Syndrome. This year our Support group on Facebook is 5 years old. The group was started on April 6th 2011 just with a few families. Now there are almost 100 families of children with BOS united. This group offers so much SUPPORT and all the parents and caregivers there are amazing by helping each other. They all make these group so successful. Update: This year we will celebrate our 8th birthday! BOS children are ANGELS. Many children have passed away far too early. Bohring-Opitz Syndrome is a life limiting genetic condition with a high infant mortality. There is HOPE – Bohring-Opitz Syndrome is not as severe in all cases than originally foreseen, children could even reach adulthood. When the novo mutation on the ASXL1 gene were discovered, many children have finally gotten the diagnosis at a later age by WES (Whole Exome Sequencing). Children with Bohring-Opitz syndrome loves to play with shiny and sparkling objects. They love music and can’t get enough cuddles. BOS kids feel like us: they have the same EMOTIONS. They are frightened, feel anger and pain. They have joy and happiness. BOS kids are vulnerable but also incredibly STRONG and brave. Many children are diagnosed with ACC (Agenesis of the Corpus Callosum), a congenital (lifelong) brain abnormality. Common characteristics associated with ACC like vision and hearing impairments, low muscle tone, feeding and sleep difficulties, seizures, to name but a few, affect the DEVELOPMENT in different. But children with Bohring-Opitz Syndrome develop, they learn at their own pace. Although children with Bohring-Opitz Syndrome looks very alike at birth, they are all INDIVIDUALS. Every child is unique and there are different levels and degrees of symptoms. Knowing one child with BOS, does not mean that all BOS children are the same. They are all individuals, regardless whether they have the same mutation on the ASXL1 gene. Children with Bohring-Opitz Syndrome are BEAUTIFUL! The word “retarded” is offensive, it hurts. Children with Bohring-Opitz syndrome deserve RESPECT. There was a time when parents were encouraged to send their BOS babies to mental institutions. What you see now is the hard work and determination of parents WILLING to fight the battle for their children, and for the many that have followed. Bohring-Opitz Syndrome is much more than just a medical diagnosis, a child with or without BOS has a MEANING, they are valuable! The premiere of the DOCUMENTARY Kuluut will be coming soon. Kuluut is a documentary about Coen and his family. Coen is 4 years old and has Bohring-Opitz Syndrome. This film is about happiness and strength! Update: The award winning documentary KULUUT is a great success and is now seen worldwide also with English subtitles! Established in 2015 by Carrie Hunsucker and Taylor Gurganus, the Bohring-Opitz Syndrome Foundation, facilitate birthday/sympathy gifts to individuals with Bohring-Opitz Syndrome who have joined their Birthday club. The Foundation also sends welcome baskets to patients who are newly diagnosed with Bohring-Opitz Syndrome. Furthermore, the foundation organizes an annual meet up event in the United States. Update: This year the AЯRE Foundation will have her 1st Anniversary. The AЯRE Foundation is the first foundation who supports and finances research on Bohring-Opitz, Shashi-Pena and Bainbridge-Ropers Syndrome, all on ASXL Family! The number of boys vs girls having Bohring-Opitz Syndrome is EQUAL. According to our knowledge there is no indication that Bohring-Opitz Syndrome is related to gender. The list of ailments and physical characteristics associated with Bohring-Opitz Syndrome is long but some main health problems like feeding difficulties and respiratory issues are common. The fact that still little is known and every child is unique makes it CHALLENGING to adapt the best treatment the child. Currently, there is no CURE for Bohring-Opitz Syndrome. However, treatments may improve various symptoms and prevent complications. Families of children with Bohring-Opitz Syndrome are not alone. The engagement of family, friends, caregivers and medical professionals is huge! Doctors and nurses worldwide are working hard to work with us for solutions and to make life with Bohring-Opitz Syndrome better. Parents know their child best – they become an EXPERT of their child. Together with professionals they strive to make living with Bohring-Opitz Syndrome optimal. BOS children teach us the true meaning of unconditional LOVE! We would like to share you the amazing journey of the AЯRE Foundation. • Complex care – An administrative headache! Learn all about music therapy. 2018 Inaugural ASXL Research Symposium was a huge success! Give the gift of support for children with all types of ASXL syndromes. From December 1, 2018 through January 31, 2019, anyone who donates $30USD or more to AЯRE will receive a beautiful 2019 AЯRE Foundation Calendar. Thank you for being part of our AЯRE community. We wish you a joyous, festive and happy holiday season! An important step towards a better understanding of the mechanism of ASXL1 mutation and Bohring-Opitz syndrome! Little is known about the role of an ASXL1 mutation in the organ development. “Recent studies using Asxl1-null mouse models indicated a critical role for Asxl1 in development. Depending on the model, Asxl1 loss causes embryonic lethality and developmental abnormalities, including dwarfism, anophthalmia, microcephaly, kidney podocyte defects, and craniofacial defects.” In this study, published in ‘Cell Death and Disease’, Moon et. al. discovered that ASXL1 gene affect the lung development. They noticed that Asxl1−/− mouses were dying just after birth due to cyanosis, a respirator failure and suspected a reduced air space and a defective lung maturation. 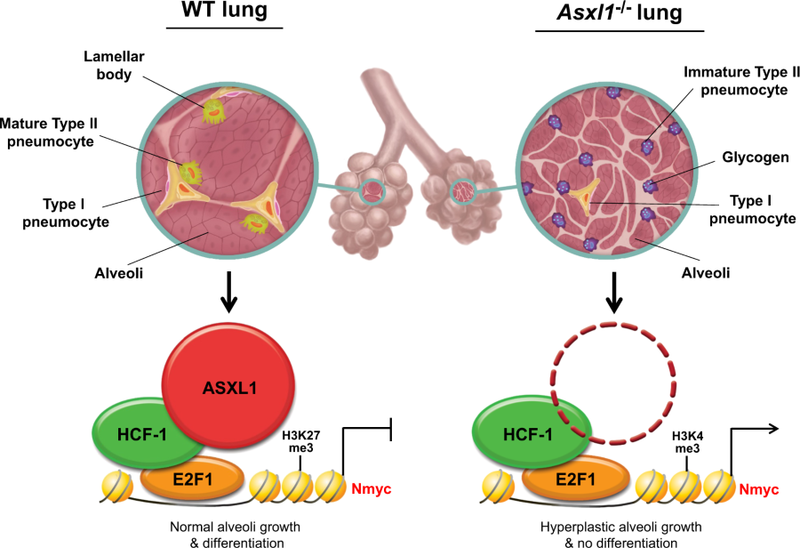 This prompted the researchers to investigate the underlying mechanism, focusing on the role of Asxl1 in lung development. Comparing a normal wild mouse, the Asxl1−/− mouse lung sank and […] failed to inflate with air because of its thicker alveolar wall, smaller air space, and more numerous small alveoli. In most of the patients with Bohring-Opitz Syndrome the novo mutation in ASXL1 has been identified. Respiratory infections and reactive airway disease are common in patients with BOS and leading cause of death in the first two years of live (Russell et.al. 2016). Having support and community resources can help increase your confidence in managing Bohring-Opitz-Syndrome (BOS), enhance quality of life, and assist in meeting the needs of other family members. Parenting is often challenging, and parenting a child with a chronic condition like BOS can add additional stress to the day-to-day challenges. It’s important to remember you’re not alone in your situation. There are people who have experience in supporting and caring for children with Bohring-Opitz Syndrome. They can provide information about all aspects of living with Bohring-Opitz Syndrome. If you are the parent or caregiver of a child with BOS, it might be helpful to talk with other parents who have a child with the same condition in our “Bohring-Opitz Support Group”. A child with Bohring-Opitz Syndrome will have a life that is different from than most children, but Bohring-Opitz children have delightful personalities and are extremely lovable. They will give you love that is totally unconditional. Please feel free to meet these amazing families who have created their own personal Facebook Pages about raising a BOS child and see how they enjoy their wonderful children! Is this list incomplete? Please feel free to send us your Story about raising a child with Bohring-Opitz Syndrome. Thank you! I am. We are. #BOSAware. Are we? Today, April 6th is marked by a global community of patients and their families living with Bohring-Opitz Syndrome (BOS) and it represents BOS Awareness Day! We specifically use the word “marked” because using the words “celebrated” or “commemorated” could potentially stir up an entirely different set of issues. We’ve seen some parents write that Bohring-Opitz Syndrome should be celebrated. However, not long after such post another parent reminds us (as if we don’t already know) that other kids are medically sick, and moreover children have died due the consequences of Bohring-Opitz Syndrome. There are sibling who wish that their brother or sister is not “disabled,” marriages that are under pressure, couples who have become separated because the burden of having a child with Bohring-Opitz is very demanding, parents who need psychological assistance to survive the emotional drain of caring for their child. So in short, there is absolutely nothing to celebrate about Bohring-Opitz. Bohring-Opitz is no fun! Someone once asked us the question…since we live it every day, do we need more awareness? If so, what type of awareness? An ‘awareness day’ occurs almost everyday in this world for something, but little is known about the impact or effectiveness of these awareness day events. On the “world-wide-web,” “awareness” seems to mean sending a message, getting attention, and getting people to talk about the issue on social media. But what takes place on the day after the awareness day? And the day after that day…? This year we took a step back and didn’t offer an online campaign for two reasons; 1) we didn’t want BOS supporters to feel that they had to choose between different campaign initiatives; and 2) there is already an abundance of online awareness actions. The possibilities to show your support for Bohring-Opitz Syndrome, and more specifically for the BOS Foundation is huge. However, are we #BOSAware without an online campaign? YES, we are. We are #BOSAware every single day. Voluntarily. We all are. Today, and for the past six years by providing desperately needed information about Bohring-Opitz and engaging families to contribute to projects like Growth Charts, Best Practices, BOS Symptoms and Features, the BOS Map and Family Stories. We support current research studies and help to make diagnosing Bohring-Opitz syndrome easier with Face2Gene. We increase, extend and offer knowledge and informational resources to medical professionals worldwide who treat children with BOS. We assist medical professionals looking for participation in clinical trials and/or network connections with other medical professionals. We encourage and promote continuous research in order to improve the quality of life of our children. We connect families and medical professionals everyday. We offer assistance to caregivers and families of newly diagnosed children via e-mail, phone, and personal visits. We help with language barriers and create a safe and friendly place to meet each other not just online within Support Group where practical, medical and emotional experiences and support is shared, but in person all over the world as families travel to meet-ups in the United Kingdom, the Netherlands, Italy and the United States. Together, all of our families are seeking answers and brainstorming ideas for solutions. We are mourning with our families and celebrating every little achievement of all of our children, which are huge milestones in our eyes. We do this every day! We are very excited and proud that this year, April 6th, marks the sixth anniversary of the Bohring-Opitz Support Group. Our family has grown and together we have achieved a great amount of resources for our children. For this reason we want to use this day, April 6, 2017, the BOS Awareness Day, to thank Dr. John Graham and Dr. Bianca Russel and all of the researchers around the world for their engagement and continued Bohring-Opitz Syndrome research. We want to thank Face2Gene, the facial recognition software which helps to diagnose our rare genetic disease. We want to thank the BOS Foundation for participating in rare disease events and attending summits and conferences to help promote medical awareness in the United States. But most of all we want to thank you, the families living with Bohring-Opitz Syndrome! Without your daily engagement, sharing of your experiences in raising a child with Bohring-Opitz Syndrome, your stories about partnering with doctors, finding helpful resources, and seeking answers, your stories of persistence and strength and hope, we would be lonely, and uninformed. You help to increase the knowledge of BOS and by collecting and publishing all your experiences and knowledge we strive to help one another and further encourage doctors and professionals to delve into this ‘knowledge’ database, which we hope motivates more future research. We are grateful, we love, we aware with you! Thank you! On the occation of Rare Disease Day last year we published 29 #BOSFACTS. A year has past and these facts about Bohring-Opitz Syndrome are still up to date. The Rare Disease Day slogan is this year ‘With research, possibilities are limitless’. Let’s go for it! Bohring-Opitz Syndrome is RARE – fewer than 60 children are published in medical articles since 1999. The largest number of children live in USA and UK, in other countries there are just 1-3 children diagnosed with Bohring-Opitz Syndrome. Parents around the world are pretty much ENGAGED by sharing their experiences in raising a child with Bohring-Opitz Syndrome. There are stories about partnering with doctors, finding helpful resources, and seeking answers… but mostly there are stories of persistence and strength and hope. Today is BOS Awareness Day! On April 6th, the day that the first support group for families and carers of children with Bohring-Opitz syndrome (BOS) is created, is BOS Awareness Day! On this day we honor all the children, born with Bohring-Opitz Syndrome, their families and friends as well as all the caregivers of these children. For this day we make extra efforts to spread information on Bohring-Opitz Syndrome, a syndrome on which is still little known. We are excited and proud that this year April 6th marks the day of the fifth anniversary of the support group. With the Facebook event “HIGH 5 for BOS” we want to thank all the families for helping each other by sharing their stories and experiences. Please join to show your support and to shed the light on all children with Bohring-Opitz Syndrome on April 6th, the Bohring-Opitz Syndrome Awareness Day! Thank you! Give a HIGH FIVE for BOHRING-OPITZ SYNDROME! We are excited to celebrate that the first Bohring-Opitz Syndrome (BOS) SUPPORT GROUP will be five years old on APRIL 6th, the international Bohring-Opitz Syndrome AWARENESS DAY! This initiative is creating a worldwide virtual high five chain in support of children with Bohring-Opitz Syndrome and their families for Awareness Day April 6th, and we need your help! Read how you can participate: Send a virtual HIGH FIVE! Help us to bring children living with BOS and their families and carers out of isolation and put them in the spotlight by wearing GOLD & BLUE DENIM on April 6th, too, and make sure you use #5forBOS! #BOSFACT – 29 facts about Bohring-Opitz Syndrome from Bohring Opitz on Vimeo. 29 February 2016 marks the ninth international Rare Disease Day coordinated by EURORDIS. This year the theme is: PATIENT VOICE! Bohring-Opitz Syndrome (BOS) is a rare disease and we want to invite you to learn more about BOS. In February 2016 we presented 29 days, every day, one fact a day about Bohring-Opitz Syndrome. Please feel free to visit us on Facebook and make the VOICE of children with Bohring-Opitz Syndrome heard.